While looking through images of our trip to Mexico, I was inspired to create this little tableau. The scale of the lunar landers is probably all wrong, but I was eyeballing it. Perspective is really tricky. This is really awesome, I love it! Of course, Daft Punk Earl is going to be my screen saver for a long, long time, but that does not mean I don't appreciate this piece as well. I really groove on how the negative spaces between the clouds can be interpreted as dark eldritch lighting coming from the mount of the temple. "Dark eldritch lightning." What a great phrase. Currently that phrase is a Googlewhack! Please use it in your next short story, the one about Earl the PR rep.
Later versions of Photoshop come with tools to help you decide on perspective. You can lay down a perspective grid to make sure that your objects all comply. You can also use perspective Transform to either adhere to or break the rules of perspective. My version also has a dynamic ruler tool. If you know the height of something in the picture, say the hatch on the LEM, which is supposed to be 32" square, then you can apply that ruler to everything else on the picture. Trigonometry would then tell you your relative hights with respect to perspective. 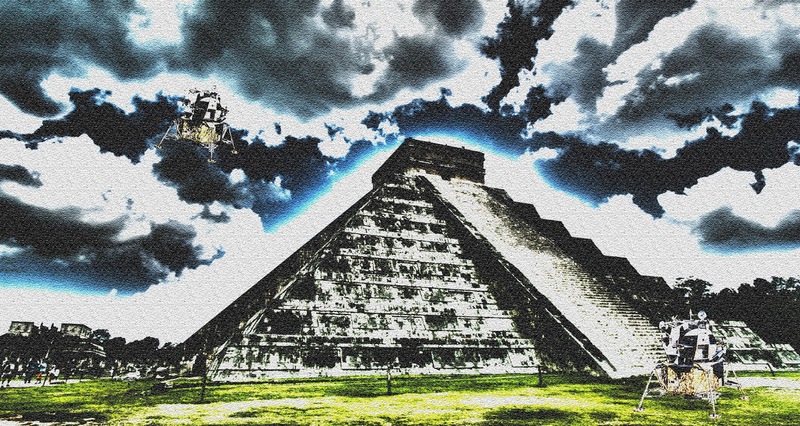 I don't know how large the stairs are at Chichen Itza, but I guess you could compare them to an astronaut, who would be roughly twice as tall as the hatch. By those standards, then yes, your landing modules might be off. But who cares? The thing looks great! Thanks Jeff! That really means a lot coming from my favourite artist. I appreciate the tips, too.